“Hey guys! I'm new to VDJ8 and I’m hoping that you can help me out here. When I try to drag and drop songs from Apple Music (ITunes) to play in VDJ the songs come up with a little red icon on the song as it hovers over either of the queue spots in VDJ. When I drop the song, it just doesn't appear in VDJ. And I found that other people were having a similar issue that their VDJ wasn't seeing playlists from Apple Music/Itunes. I tried the fix which was to go into iTunes Settings and clicking the box which allowed other programs to use downloaded songs. This allowed me to see my playlist folders in VDJ, but when I click on the folder in VDJ, there is no song in there to choose from." Many Apple Music and Virtual DJ lovers are encountering the same problem as the lead-in case. Why can't we upload our beloved Apple Music songs to VDJ like other music? 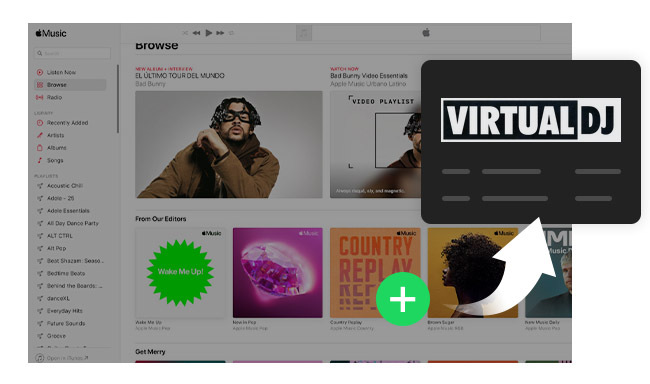 This article is going to answer the question and show you a simple and easy way to add Apple Music to Virtual DJ Software. Part A. Why Can’t We Add Apple Music to VDJ? Apple Music is a streaming music service offering subscribers encrypted .m4p format songs that can be listened to in iTunes or with Apple Music App only. Therefore, we can’t play Apple Music on Virtual DJ Software, MP3 Player or any other non-licensed media software. So even if we manage to see the playlists from Apple Music / iTunes from the browser of VDJ, we are unable to successfully load those songs into the deck of VDJ. To make it easy, it’s the encrypted .m4p format that prevents us from playing Apple Music on VDJ. If we can convert the encoded .m4p format to other popular formats, mp3, for example, we will then be able to easily add Apple Music songs to our DJ mixing app. Here comes the key issue: How to decrypt Apple Music to .mp3? NoteBurner iTunes DRM Audio Converter, a combination of Apple Music Converter, Audiobook Converter and iTunes M4P Music Converter, is the perfect tool to do the job. It can easily convert protected Apple Music & Audiobooks & iTunes M4P music to MP3/AAC/WAV/FLAC format. Part B. How to Add Apple Music to Virtual DJ Software? The following is a detailed tutorial to import Apple Music to Virtual DJ software: 1) Convert Apple Music to MP3; 2) Add converted Apple Music to VDJ. Launch the program. Click button "+" on the upper left. A pop-up window will show you all your downloaded Apple Music in iTunes. Select the Apple Music that you want to dj with for converting. Click the setting button on the upper right of the interface, and then a pop-up window will enable you to choose output format ( MP3, FLAC, AAC, WAV), output quality, as well as output path. Here we choose MP3 as the output format. 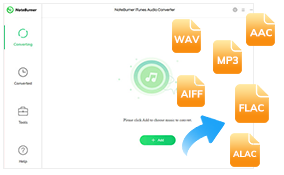 Click button "Convert", and all the Apple Music you chose in step 2 will soon be converted to MP3 format and downloaded to the output folder that you customized in previous step. Now that we’ve got unprotected Apple Music songs on our computer, we can add the songs to the deck of VDJ at ease: 1) Launch Virtual DJ; 2) Find the browser pane at the left bottom of the utility; 3) Find the folder that saves the converted Apple Music songs; 4) Drag and drop the music file from the browser pane's center column directly onto the virtual turntable of your choosing. Doing so to add your Apple Music to Virtual DJ. Done!